Saucy Asian Meatballs Recipe - Gutom Na! Posted on Thursday, March 9th, 2017 at 5:32 pm. Mix meatball ingredients with hands until just combined. Roll into (15-16) golfball sized meatballs and transfer to rimmed baking sheet lined with foil. Bake for 40-45 minutes or until meatballs are cooked through to 160°F internal. Combine all sauce ingredients in 3qt. Pot over medium heat. Heat for 10 minutes while stirring occasionally. Once sauce begins to simmer, remove from heat. 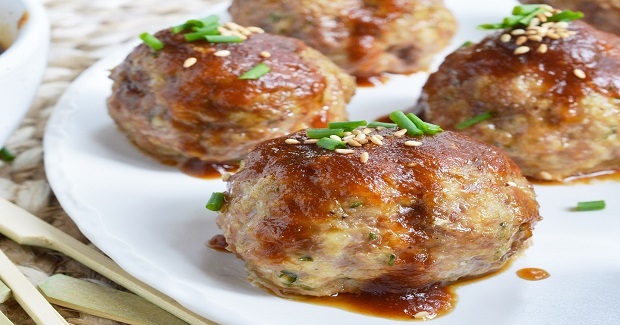 Serve meatballs with sauce, fresh chives and sesame seeds.